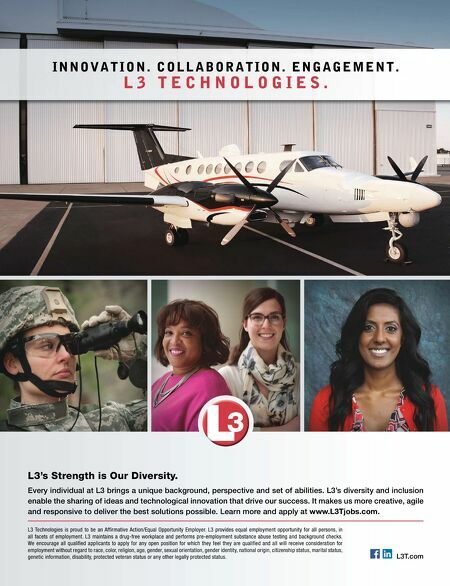 L3's Strength is Our Diversity. Every individual at L3 brings a unique background, perspective and set of abilities. L3's diversity and inclusion enable the sharing of ideas and technological innovation that drive our success. It makes us more creative, agile and responsive to deliver the best solutions possible. Learn more and apply at www.L3Tjobs.com. L3T.com L3 Technologies is proud to be an Affi rmative Action/Equal Opportunity Employer. L3 provides equal employment opportunity for all persons, in all facets of employment. L3 maintains a drug-free workplace and performs pre-employment substance abuse testing and background checks. We encourage all qualifi ed applicants to apply for any open position for which they feel they are qualifi ed and all will receive consideration for employment without regard to race, color, religion, age, gender, sexual orientation, gender identity, national origin, citizenship status, marital status, genetic information, disability, protected veteran status or any other legally protected status. I N N O V A T I O N . C O L L A B O R A T I O N . E N G A G E M E N T . L 3 T E C H N O L O G I E S .